Note: this is an evening meeting, for the first time. 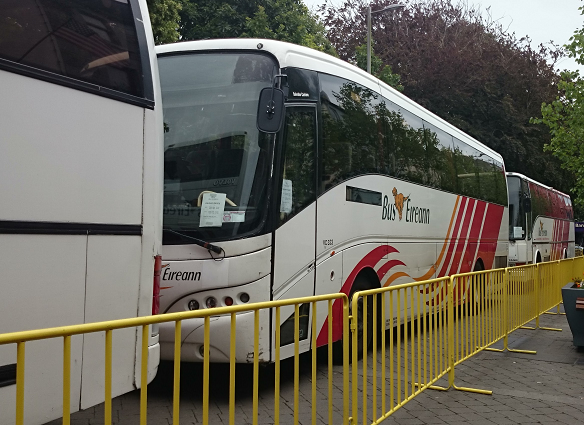 Bus Éireann are running the races-special service between Eyre Square and Galway Racecourse. Shuttle buses will leave Eyre Square every 15 minutes or as required from 2pm until 7pm. The return services will start at 7pm and run until 9:30pm. The return services will start 7pm and run until 9:30pm. Shuttle buses will leave Eyre Square from 11am until 4:45pm, every 15 minutes or as required. The return services will start at 5pm and run until 8:30pm. Return services will start at 5pm and run until 8:30pm. Shuttle buses are advertised as leaving Eyre Square "as required" from 11am. However in previous years, the special buses have not run on Sunday, and so most people catch the regular 403 or 409 bus. Extra buses are usually put on route 409 to meet demand later in the afternoon. Adult: €6 single and €9 return. Children: €3 single and €5 return. Booking is not required, or possible. Pay in cash only when you catch the bus. 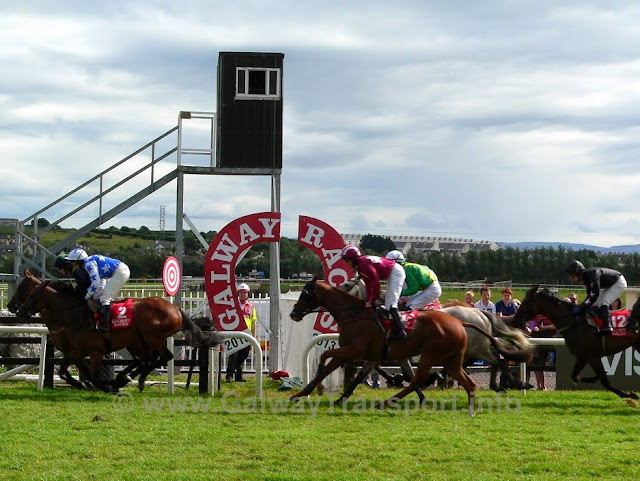 Free Travel Pass and TaxSaver tickets are not accepted on the Galway Races shuttle buses. Shuttle buses leave from the west side of Eyre Square, outside the Skeffington Arms Hotel (map). Drop off is through the tunnel entrance, within 50 yards of the course-entry. These shuttle buses do not pick-up or drop-off along the way. See "Regular Galway city services to Ballybrit" below for information about services which do. No services running from Oranmore village this year. Instead, use the regular bus or train to Galway city, and catch the bus from there. Note that the 29 July 2018 changes to Bus Eireann's Route 20 have reduced the number of regional buses stopping at Oranmore. Return buses after the last race each day. 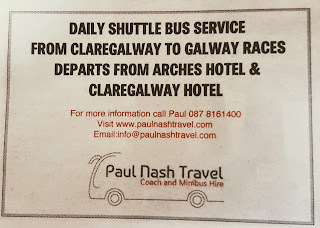 This year, the Bus4U special bus from Roscommon will also pick up passengers at Claregalway (see below for details). Or, see the Claregalway Neighbourhood Map for information about regular public transport services from to and from Galway City. Lough Rea Hotel are offering a bus meal package on Monday, Tuesday, Wednesday, Thursday and Friday only. Bus leaves the hotel approx 1.5 hours before the first race, and the return bus leaves 30-40 minutes after the last race. This is open to members of the public as well as hotel guests, but must be booked in advance - tickets are non-refundable and non-transferrable, and all tickets include the meal as well as return bus ticket. and returning one hour after the last race. Scheduled Burkes servies from Tuam and Dunmore travel into Galway along the Tuam Road. They have a regular bus-stop at the racecourse entrance at Two Mile Ditch, beside Kenny Motors and McMahons. See North Galway regional bus services for links to their pages. Some hotels in County Galway and beyond offer packages including races tickets and access to a shuttle-bus - contact them directly for more information. Apart from that, there are not usually special services from other Irish cities. Instead, use the use national and regional services to get to Galway: these stop very close to where the races shuttle buses leave from. Route 409 - from Eyre Square, travels along the College and Dublin and Doughiska Roads. 4pm to 6pm on Friday. The last bus-stop during these times is at the top of Doughiska Rd (route 409) or Clayton Hotel (route 403) - see the Doughiska neighbourhood map for locations. Passengers going to/from the racecourse, Parkmore West Industrial Estate, Parkmore East Business and Technology Park, Galway Technology Park, Racecourse Business Park or Briarhill Business Park will need to walk for approx 15-20 minutes from this last stop. Note: These times are based on the overall road closure times in the area, and may be extended if there are traffic management problems in the area. The usual city bus fares apply, and Travel Pass and TaxSaver tickets can be used. The Nitelink service between Athenry and Galway will run from Wednesday until Sunday inclusive. The 5:10pm Galway to Athenry service will not run from Mon-Sat. 4:40pm from Galway to Tuam. 4:25pm Galway to Longford route 425 (via Mountbellew) will not leave until 5:15pm. 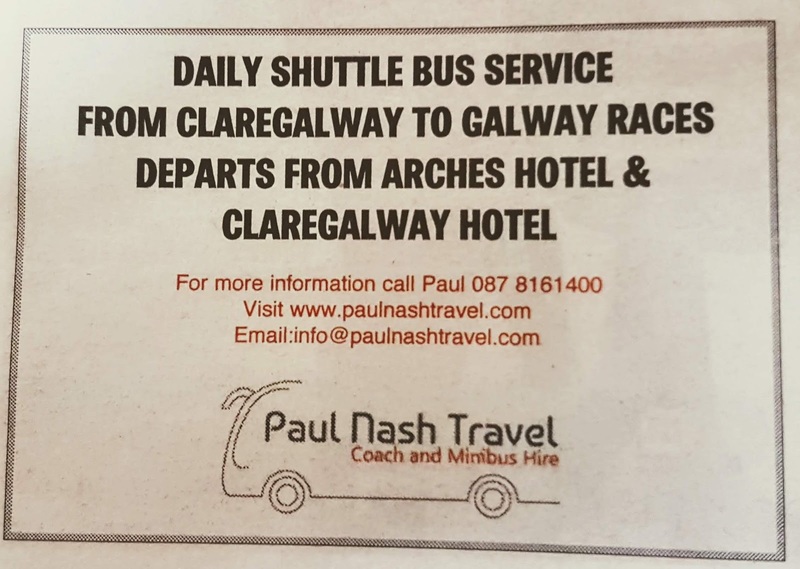 All other Galway regional bus services are expected to operate normally during Race Week - though may suffer some delays due to traffic volumes. Irish Rail are running extra trains to/from Galway as shown below. There is limited capacity, and booking on-line in advance is strong recommended, for both these trains and for regular services. Regular services will run on all other days. The full traffic-management plan for 2018 has not yet been made available. Traffic from the south and east (M6 / N6 or Oranmore south) can travel via Carnmore Cross and use the Blue Route - Avenue entrance - garda will control crossing right turn at Briarhill junction. There is no access to the Avenue entrance from the N6 Eastbound (Dublin road) during the road closed times (listed above, under city bus changes). Traffic from the south and east (M6 / N6 or Oranmore and south) can travel via the old N6 and Galway clinic to use the Red route Tunnel entrance. After the Briarhill junction, races traffic use the right lane, and city traffic use the left lane. Traffic from the north (Tuam) can use the Green route - Hill / Tuam Rd entrance - or turn left at the Parkmore Rd and use the Avenue entrance. Traffic from the city and west can use either the red entrance (via Bothar na dTtreabh), or the green or blue entrance (via Tuam Rd).